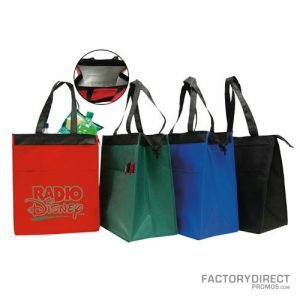 Customizable reusable bags are so popular because they continue to give your brand exposure, increase recognition, and let your customers know that your company is proactive concerning environmental issues. These recyclable cooler bags are great for taking lunch to work or snacks on a trip. The durable construction keeps the cold in and the front pocket is a handy spot to stash napkins or utensils. Personalize this reusable bag with your company’s logo on the front to get your brand noticed. We are able to offer quality bags at low prices, because, as our name implies, we work directly with the factory. Our direct factory relationship means there is no middle man which also means we can keep our prices low, so you have an affordable and eco-friendly way to market your brand. Our overseas factory team can also help you fine-tune your bag, select the size, colors, add-ons, and more for the perfect design at a great price.